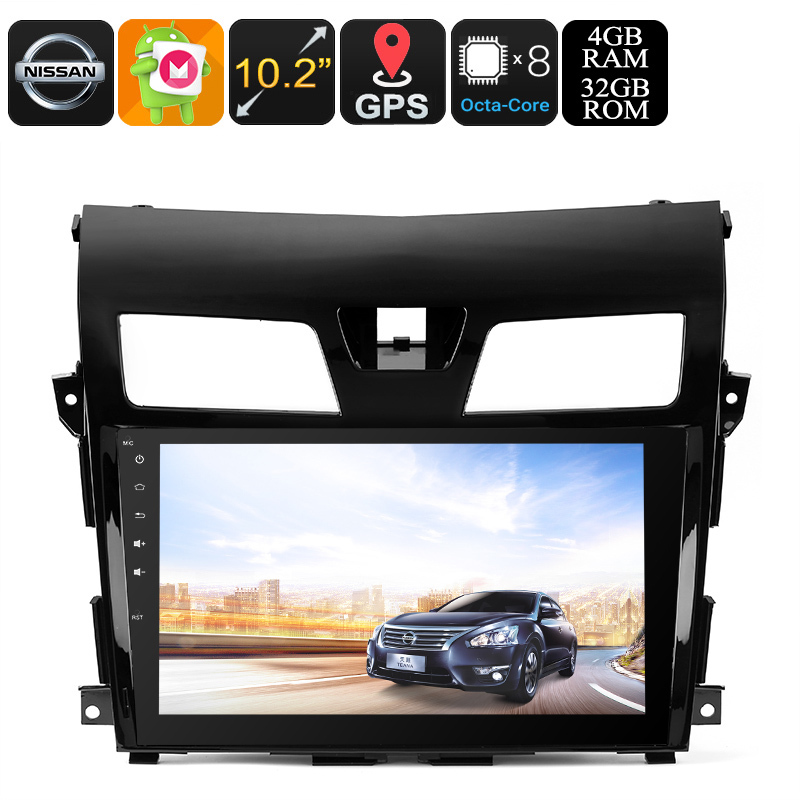 Successfully Added 2 DIN Android Media Player - For Nissan TEANA, 10.2 Inch HD Display, 3G&4G Support, GPS, Android 8.0.1, CAN BUS, Octa-Core CPU to your Shopping Cart. If you’re looking for a way to pimp up your Nissan TEANA, this Dual DIN Android Media Player is perfect for you. It comes with a stunning 10.2 Inch HD display that will put hours’ worth of entertainment into your vehicle. Thanks to its Android operating system, this 2 DIN car media player lets you enjoy all the basic Android features straight from your dashboard. You’ll be able to watch movies, listen to music, and play games. It even allows you to browse the web thanks to its 3G dongle (not included) support and WiFi connectivity. Thanks to this, you’ll always have the means necessary to stay connected to friends and family. With this Android media player at your side, you can be guaranteed that your passenger will never experience a single moment of boredom again. Thanks to its Bluetooth support, you’ll be able to sync it with your smartphone or tablet. This brings along great usability for those of you that wish to enjoy their favorite songs while driving the car. Naturally, it also supports regular AM/FM radio and it comes with a built-in radio tuner. With its USB and SD card support, you can insert media via an external source. Thanks to this, you’ll be able to carry along your favorite films and series and watch them even while traveling abroad. Additionally, its SD card slot provides you with a port to insert the Android maps for your GPS navigation system. With its highly accurate GPS navigator, this two DIN car media player makes sure you’ll never get lost again. It supports 20 channels and provides you with clear 3D maps of your area and upcoming travel route. No matter where your next trip will take you, this GPS will lead your way. From now on, you’ll always be able to reach your upcoming destinations in the fastest and most efficient way possible. Behind its beautiful HD display that features a 1024x600p resolution, this media player hides some sophisticated hardware. With its Octa-Core processor and 4GB of RAM, you can tackle basic Android applications, games, and more. It furthermore supports 32GB of internal memory that gives you enough space to keep all your media. For those who need even more, it also allows you to insert external media via its USB and SD inputs. From now on, you’ll always be able to keep your passengers entertained throughout the trip. This makes your 2-DIN media player the perfect car accessory for the upcoming holiday season. Arabic: - نظام ترفيه سيارات الدين 2 - Chinese Simplified: - 2 DIN 车载娱乐系统 - Czech: - 2 DIN Car Entertainment systém - Danish: - 2 DIN bil Entertainment System - Dutch: - 2 DIN Car entertainmentsysteem - French: - Système de divertissement de voiture 2 DIN - German: - 2 DIN Car-Entertainment-System - Hebrew: - מערכת בידור לרכב דין 2 - Hindi: - 2 DIN कार मनोरंजन प्रणाली - Italian: - 2 DIN auto sistema di intrattenimento - Japanese: - 2 DIN 車エンターテイメント システム - Korean: - 2 DIN 자동차 엔터테인먼트 장애 - Malay: - Sistem hiburan kereta 2 DIN - Norwegian Bokmål: - 2 DIN bil underholdning verdifall - Romanian: - Sistem de divertisment auto 2 DIN - Russian: - 2 DIN автомобилей развлечения системы - Spanish: - Deterioro de entretenimiento de coche 2 DIN - Thai: - ระบบความบันเทิงในรถยนต์ 2 DIN - Turkish: - 2 DIN araba eğlence sistemi - Vietnamese: - Hệ thống giải trí xe hơi 2 DIN.